Weapons check will be open for 2 hours on Wednesday 31stevening, and for one hour before each event. Exact details will be released with the detailed schedule. Curtin University is approximately 15 minutes by car from from the airport and from Perth city. There are accommodation and dining options in suburbs around the University. There are two bus stations at Curtin University. The older Hayman Road Station (Curtin University Bus Station) is on the east side of the campus, about 850 meters from the fencing venue in The Curtin Stadium. The new Curtin Central Bus Interchange (Curtin Central Bus Station) is on the west side of campus, right next door to the fencing venue in the Curtin Stadium. We recommend that you use the Curtin Central Bus Station. There are several Transperth bus routes and some of these buses can be connected by train at the Canning Bridge Train Station (Bus No. 100 or 101 every 7 minutes) or the Oats Street Train Station (Bus No. 998 every 15 minutes) to Curtin University. The link below advises of all the Transperth buses that go to Curtin University. The Hayman Road old station (Curtin University Bus Station) buses are listed first. Preferably use the buses for the new Curtin Central Bus Station that are listed second, this will save you a 12 minute walk across campus J. If you will be parking on campus on a weekday then we recommend you download the App CellOPark onto your mobile phone before arriving at Curtin for easy payment of the parking fee. Please allow plenty of time to find a parking bay, especially during peak times of 8:00am-11:30am weekdays. Don’t forget to activate your parking upon arriving and stop parking when leaving campus. Parking is free after 4.30pm Monday to Friday and is free on the weekends. The map above gives you your options and the different costs for parking on campus. 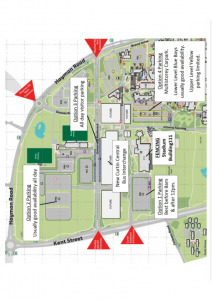 Option 1 Parking – Parking available in the green area for students and visitors. Availability is usually best before 8am and after 12pm. Use the CellOPark App for payment of $0.76 per hour or a maximum charge of $4.06 per day. Do not use the reserved bays in this area. Option 2 Parking – Parking available in the green area for students and visitors. Usually fairly good availability all day. Use the CellOPark App for payment of $0.76 per hour or a maximum charge of $4.06 per day. Options 3 and 4 Parking – Blue Visitors bays (on University Boulevard and in the lower level of the multistorey carpark on Beazley Avenue) can be paid by ticket machines or alternatively using the CellOPark App at a cost of $3.45 per hour. Yellow bays on upper level of the multi storey carpark have limited availability. Use the CellOPark App for payment of $1.52 per hour or max $6.10 per day. Rates have been noted as of 8th April 2019 and maybe subject to change.